Jane, thank you so much for taking the time to chat to me. I am a massive fan of your books with two of my particular favourites being The Spirit of the Home and The Natural Year. In fact, The Natural Year was a real inspiration to me when I was thinking out The Practical Goddess course. I’m always checking what I should be doing in a particular month. Do you have a favourite out of your books and why? Hearing that you love my books spreads the broadest grin over my face. Writing is such a solitary process and so feedback like that really makes my day, week, month, year. Right now, I’m going through my old books and hoping to give them a second lease of life. I’m looking for a new publisher for The Natural Year and hoping to have the chance to update it. While the ancient wisdom obviously doesn’t change, there are so many new and exciting therapies and techniques I’d love to include in a new version. It’s available in a Kindle version but having a physical book to thumb through makes all the difference, I feel. As for my favourite book, that changes. Over the last year I fell in love with The Energy Secret all over again – it was my attempt to demystify the whole area of vital energy and to make energy working something simple and natural. We’re all natural energy workers and very easy techniques can help us tune into our own intuition, healing powers, call it what you will. However, since moving into my new home, I’m now re-reading Spirit of the Home. In fact, only yesterday I had a conversation with its original publisher (HarperCollins) who have agreed to republish it with a spanking new cover (plus I get to wave a light edit over it – it’s incredible how life has shifted in the twenty years since it was published – back then I was talking about fax machines and ansaphones!). So, there you have it – breaking news. I am so incredibly excited. When we spoke you mentioned that you recently moved home. Which of your rituals and tips for creating a sacred space are you using to make it your own? Yes, just before Christmas I moved into my new home, a small Victorian terrace in Exeter. I bought the house in May but it was in a very sorry state and so needed to be taken almost back to its bones (much like me really – how our homes reflect our bodies!). It was a fascinating process, a real learning curve in patience and compromise. I had a very clear vision for how I wanted the house to look/feel/smell/taste although, interestingly, I didn’t follow my own advice and make a physical treasure map – I dedicated a Pinterest board to my vision. My husband and I had separated (very amicably) and this was going to be my first ‘home alone’ space for nearly 30 years. I wanted clarity, space and peace above all so the vision was very uncluttered and clear – a blank canvas that would allow my mind to settle. I’m not entirely sure who I am yet in this new incarnation so I figured my new house could help me with that. We’re gently bringing each other back to life, my house and I. Just as my old house sold I went to India, to an incredible place called RAAS Devigarh in Rajasthan. It was perfect timing. I was feeling very dislocated and sad at leaving my home (and my marriage) and Devigarh (it means ‘abode of the goddess’) was a true soul healer (it helped that I was there with the incredible Denise Leicester and Fiona Arrigo leading the retreat – blissful goddesses, the pair of them). 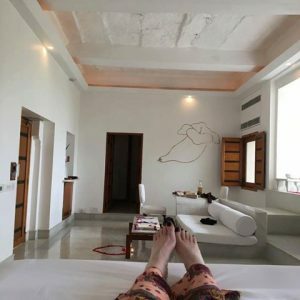 Devigarh became my blueprint for my new home – with its soothing decor (predominantly white with splashes of colour), sounds, scents and tastes. I performed a huge decluttering before I moved in. I realised just how much I had been holding onto energy from my mother in particular. I was even sleeping on her mattress – so that had to go! Once I moved in, I flung open the windows and smudged the house from top to bottom, using the space clearing techniques in Spirit of the Home and another of my books, The Smudging and Blessings Book. I also talked to the house – so far it’s not the most communicative creature but we’re getting there! Then I filled it with gorgeous scents. The new ilapothecary range is stunning. The Good Vibes Reeds, with ylang ylang and tuberose, are heady – everyone who walks in asks what the incredible scent is. The Beat the Blues spray is another new favourite. We’re spending this month in The Practical Goddess course decluttering and creating our sacred spaces. It can be such a challenge to get rid of stuff – especially things we’ve been gifted or inherited. I love the idea of you and your house growing and finding yourselves together. The Good Vibes Reeds sound heavenly – I think they will be getting added to my shopping list. You’ve been called ‘Britain’s top writer on alternative therapies’ and have written over 20 books on the subject – what first got you started? That title was given to me a LONG time ago – I’m sure there are plenty of other people who deserve it far more! I was very lucky basically. I grew up in a household that was into the esoteric – my mother was into yoga and meditation way back in the 1960s. My brother studied Zen Buddism and Kabbalah, my sister was more Vedic in her approach. Nobody scoffed if I built a little altar for the nature spirits in the garden. Nobody batted an eyelid if I talked to my (deceased) cat. 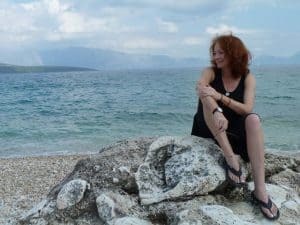 I maintained my interest in holistic medicine and spirituality throughout school and university, and even when I became a journalist (I initially wrote about the arts). My editor at the Evening Standard used to get me to write the occasional feature on natural therapies and dubbed me the ‘weirdy-beardy correspondent’, thinking the whole thing was mighty amusing. Then it was all serendipity really. The Daily Mail asked me to write a series on complementary medicine which then led to a weekly column called Self, in which I road-tested different therapies each week – it was an extraordinary time in which I was lucky enough to meet literally hundreds of incredible therapists. 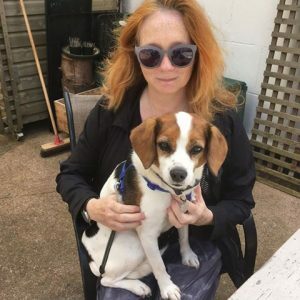 Judith Chilcote, a literary agent (who became a great friend) got in touch and suggested I should write a book which became Supertherapies, my first book. The rest, as they say, is history. So…luck. Good timing. Serendipity. Call it what you will. I call it lucky for us! What a great adventure and what a wonderful way to grow up. I’m quite a seasonal person and they really impact how I live my life, which is maybe why I love The Natural Year so much. Although I love winter, I’m starting to get quite excited about spring. Do you have a favourite season and why? That’s such a hard question as I truly do love each in its own way. When I was younger it was definitely autumn – that fresh energy, that back to school feel. Now, if you were to push me, I’d probably say spring – as one gets older, new beginnings are very beguiling. I’m not at all jealous of the fact that you visit spas and sacred spaces as part of your work. What are your top three .. and do you need an assistant? Please don’t hate me! I know I am seriously lucky and, truly, I never ever take it for granted that I’m invited to such stunning places of deep healing. Just three? Oh, that’s hard. I’ve already mentioned Devigarh so that doesn’t count, does it? I’m also head over heels in love with Yobaba Lounge in south-west France – a magical village chateau owned by the wonderful Gertrud who is another true goddess. Gertrud runs beautiful curated retreats that really soothe the soul or you can go on self-retreat there too. Her food is exquisite and she leads thoughtful body-centred yoga too (if you’re scared of yoga, this is a great place to start your journey). Serenity Retreat in Greece holds a very special place in my heart. Very simple accommodation right on the beach. Space to be yourself, to be sociable or not, just as you need. Quietly, carefully, kindly curated by Zen Buddhist meditation teacher Kim Bennett, a true inspiration. The third? I think it has to be Penninghame in Scotland. The place itself is gorgeous but it’s more the work that is done there that is so special – very deep soul work that creates profound shifts in people. I credit if for nudging me out of the underlying depression I’d suffered since childhood. There are other great ‘deep dive’ processes (I also love Path of Love and The Bridge) but I keep sending people to Penninghame – I just know they look after everyone so carefully. My husband has been and our son is now keen to go – I am over the moon. Imagine getting your core wounds healed at the tender age of 19? I’m so proud of him. These all sound absolutely wonderful. Serenity Retreat in Greece is right up there in my bucket list. Kim is another one of my biggest inspirations! Do you take anything with you when you’re travelling that connects you to your sacred home space? Many of my clients are stressed, anxious and overwhelmed. What one tip (apart from buy all your books of course) would you give them? I go into this in detail in my book The Overload Solution. If you want to get off the stress/anxiety/overload hamster wheel, it can take a radical rethink of your life. However, as far as there is one quick fix, I’d say it’s meditation. Old hat, I know, but it seriously shifts how you view life. It needn’t be fancy – just taking out even five minutes at the start of the day to focus on your breath. I’ve been playing with the Buddhify app lately and it’s really great (I much prefer it to the market leader Headspace) – there are masses of guided meditations for every moment of the day. Along the same lines, here’s a little mindfulness tip that is brilliant for anxiety and overwhelm. The moment you feel yourself getting anxious, bring your awareness to where you are RIGHT NOW. Feel your bum on the seat, or your feet on the floor. Ask yourself, ‘Am I okay, RIGHT NOW? This very moment?’ And, of course, you are – we all are in that very second. We tip into anxiety when we project forwards, even by a minute or two. Keeping it into the moment is the key. I have even managed to overcome quite extreme pain (a gallstone attack) using this – it’s hugely powerful. My copy of The Overload Solution arrived yesterday and I’m half way through already – I feel like you wrote it for me. I had a burnout a couple of years ago which resulted in a relapse of CFS. I’ve had to make a lot of changes in my life in order to recover – I wish I’d know about this book then! I can tell already that your book will be a great resource for me and my clients – thank you! Ah! I completely forgot about that! Animals are massively important in my life. Dan is a real blessing – he is gently snoring in his basket next to my desk as I type this. We can learn so much from animals – their loyalty, their being in the moment, their infectious joy, their total unconditional love. Technically he’s my son’s dog (his ‘soul puppy’) but I get to look after him while James is away at university. I’ve also done a fair amount of shamanic work in my path and have had very deep and meaningful relationships with a variety of spirit animals. I put a lot of my experiences into a novel I wrote called Walker, set on my beloved Exmoor and featuring some very powerful animal guides. I really need to update that section, don’t I?! In the past year or so, my life coaching practice within Vitality has taken a shift and my focus is now on contentment coaching, as I feel quite deeply that this is what people are really searching for. What does contentment mean to you? Contentment? Ah, that’s a lovely aim. As I get older, I find contentment far more easily and simply. Contentment is settling onto my meditation cushion and letting go of everything for 20 minutes. Contentment is snuggling up on the sofa with my dog, one of my favourite mantra CDs in the background. Contentment is waking up on a Sunday morning (dog on bed of course), stretching and then curling back up and reading. Contentment is a freshly made mocha piping hot in my favourite mug. Contentment is having my son home for the weekend. And so on and so forth – it’s just being aware of these little moments of bliss and ease – the heart of mindfulness, I guess. It’s realising that we don’t have to be in the ‘perfect’ place, in the ‘perfect’ job, or whatever – there is such beauty in the simple things all around us – right now. My last question is a little bit cheeky. I’m running my very first residential retreat at the end of July in Forse of Nature, a gorgeous country house nearby. I’m super excited and just a little bit terrified .. eek! Can you give me some tips to make sure it’s a wonderful experience for my attendees? allow enough space – in all senses. It’s easy to want to pack masses in but when people are on retreat, they need plenty of processing time. Needless to say, make sure the space has been totally cleansed before you go in. I’m often shocked to find that retreat centres (and their retreat leaders) don’t take this seriously enough. I’ve walked into some places that felt very ‘sticky’, which were retaining the energy of the last group. The Blush Love goddesses always smudge everyone before they come into ‘sacred space’ areas of the retreat – that’s an extra little bit of housekeeping, and a lovely little ritual in itself. Indulge the senses, all of them. Beautiful scents, lovely flowers, snuggly throws, open fires (inside and out – have to love a fire ceremony). Let there be plenty of ‘nooks’, hideaway places to curl up with a book or a journal. 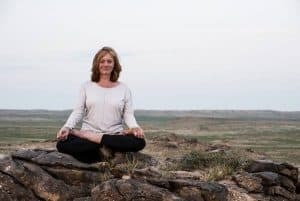 Play with sound and silence (I find gentle chants really create a nurturing atmosphere) – equally I do love a retreat that offers periods of silence – there’s something beautiful about being with people without having to talk all the time. Creature comforts – I love a retreat with a good selection of scrummy tea bags and treats. 42 Acres really does that to perfection – there’s always some kind of home-made snack appearing on the kitchen table. Call me a bit venal but I’m also a total sucker for a goodie bag. I get a little frisson when there’s a welcome pack in my bedroom. A printed schedule along with any house rules or retreat tips is reassuring. I also love being provided with a notebook and pen for journaling. Serenity Retreat adds a lovely welcome note along with a posy of wild flowers (so sweet). The Body Retreat does the BEST goodie bags – samples of delicious body products, a BPA free water bottle, a funky t-shirt. Thank you so much Jane – I will definitely be putting these tips into practice on our retreat <3 If you’re ever looking for a retreat in the wilds of Scotland, you’d be very welcome <3 I’m hoping to run a cosy winter one later in the year full of log fires, snow and cosy chill out corners 😊 It has been really wonderful to get to know you a little better. Thank you for some great tips – I’m sure all our readers (including myself) will have a shopping list of goodies to take away from this. Readers, I honestly can’t recommend Jane’s books enough – click on the links in the blog to find the one’s mentioned and here are some additional books below. You can also find loads of information as well as great articles and blog posts on Jane’s website http://exmoorjane.com/ and you can keep up with her adventures on facebook, twitter, instagram and pinterest. What an interesting life she’s lead so far! I’m intrigued by a lot of the books and things she’s suggested. Thanks for adding more to my reading list! !